That's how many quarts of applesauce we canned and froze this past Tuesday- one less quart than last year. We sauced the same amount as last year (8 bushel) because, while we did run out mid-summer, making more than 180 quarts just seems silly. Doesn't it? 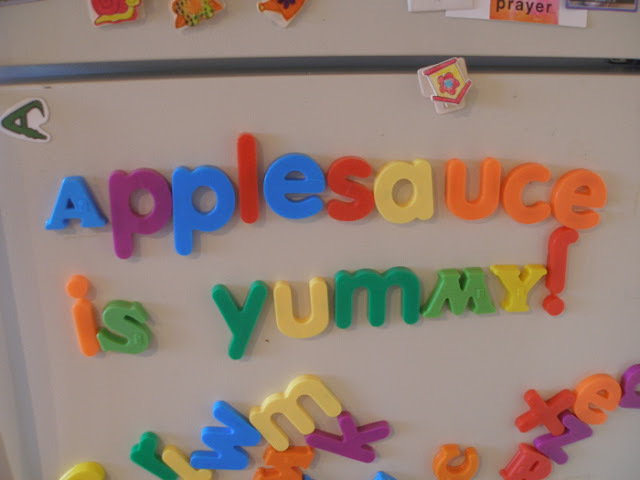 We used to travel north a couple states to make applesauce with my family because making applesauce with family is fun as well as because that is where we can get Cortland apples (our favorite saucing apple). It makes a super-sweet sauce without added sugar and if you can get the red variety, the sauce is pink (we add red raspberries to make ours pinker). As our little family grew, our share of the apples grew and, before we knew it, everyone was helping to (mostly) make our applesauce and that isn't quite fair. So, starting last year, Jamey's parents (a.k.a. 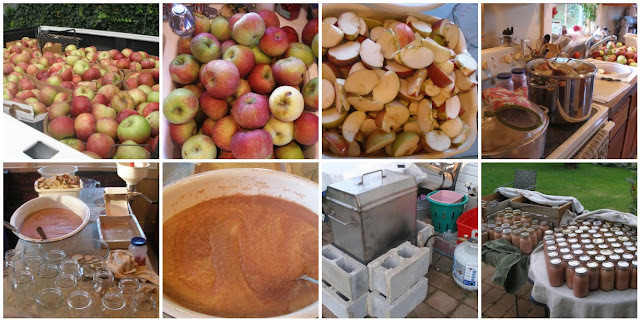 the apple angels) have been bringing down to us our apples (as well as their outdoor canner which holds 15 quart jars) and then they stay and help us make sauce. I told you they're angels. Last year we canned 103 quarts and froze the remainder. Our freezers are much fuller this year, so we needed to can more. We ended up putting 139 quarts of it in jars and the rest in plastic containers. Our pantry and freezers are bursting at the seams. The day went almost the same as last year. We are becoming a well-oiled machine. We were all at it by 7:30am, although my dear husband got up MUCH earlier and starting washing, chopping and turning. Soon after 3pm, I was mopping the floors. We can't thank Jamey's parents enough. It's a long, steamy, sticky day, but it makes tackling a huge project like this quite enjoyable when you have good company to do it with. 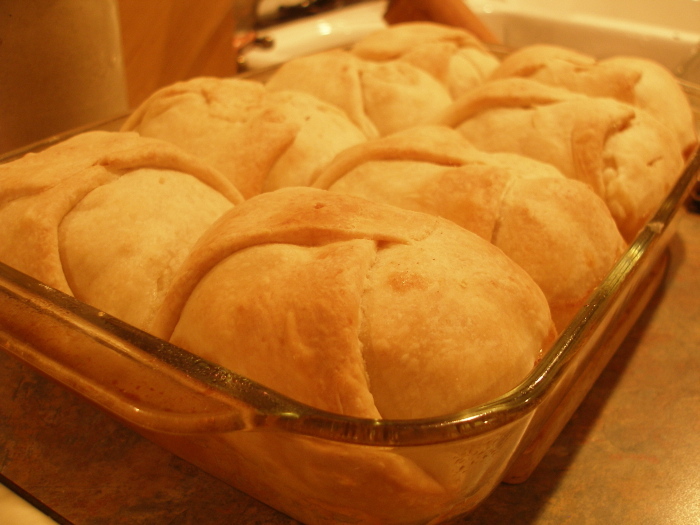 Oh, and did I mention that after all that, Jamey's mom made us apple dumplings? She did. Well done! Do you happen to know what recipe she used for the dumpling dough? I think I need a nap after reading that. Wowza! That's a lot of sauce. Awesome job! I am so ready to move somewhere with produce like this available (we're high and dry in the middle of an awful drought, and availability isn't great in a good year). Can't wait till I can join you in producing quantities like that...enjoy! Applesauce Angels INDEED! Do they travel? all I can say is WOW!!! great job!! What a great job you all did. Can I have the dumpling recipe?? There's no real "recipe", but here's what she does. She halves the apples, then cores and peels them, leaving them in halves. In the center (where the core was) she places a small pad of butter and sprinkles in cinnamon and a little brown sugar. Then, she puts the halves back together like a whole apple and wraps it in pie crust dough, places them in a greased pan with a wee bit of water in the bottom, then bakes them at 350 until a knife inserted into one of the apples glides in showing the apple is soft and until the crust is lightly browned. Some people make a butter/cinnamon/brown sugar glaze on the stove top to pour over the tops, but we prefer to eat them plain and warm, with some milk over top. I'll add that baking apples work best:-). What a gorgeous picture of the steamy hot apples. Yum, and I can vouch for the fact that your sauce is good eatin'! Those dumplings look heavenly....pie dough, huh? I might have to try this. Wow, Jane! That was such a good day's work! It sounds a bit tiring..but very satisfying too. I have a questiona about water bath canning outside for ya. When we did it a few weeks ago, the jars kept cracking b/c they weren't hot enough to meet up with the boiling water. I think we would have needed to take each jar out to the canner one at a time so they would not cool off. I thought they were still hot, but not enough I guess. How did you all do it? Amazing you are! Wow! My question is what is the cinder block set up? Do you can outside; if you do I would love tips (if you don't mind sharing). Our jars were filled just before we placed them in the canner with very hot applesauce. With four adults working fast, the apples didn't linger anywhere for very long between the hot stove, the strainer and the jars, so they were piping hot. We were actually a bit concerned about them cooling off too fast once we pulled them out of the canner. It was probably in the upper 40's, lower 50's when the first batch came out. We covered them with blankets on the table to allow them to cool off slowly and this seemed to work really well- no cracks and all of them sealed. I believe Jamey put those cinder blocks there to block the draft and help contain the heat of the propane burner (he's big on conserving energy). The only time we can outside is when we do applesauce like this (a big project). The huge canner, stand, burner and tank belong to our in laws. They bring it down and let us use it. It comes in really handy when you have a project like this and need your stove top burners for cooking down the apples. Most canning projects I do myself so I wouldn't want to mess with outdoor canning (especially because I'd be concerned a child would touch it if I wasn't always monitoring it) AND, by myself, I wouldn't be able to keep up with the canner- it would sit their empty and boiling, waiting for me to get the next load in. Thank you for answering; very creative! WOW!!! I thought I put up a lot of apples -- just canned apples, apple butter, and pie filling this year as I still had applesauce left. I am as amazed again this year as I was lats, what an accomplishment! Thanks for answering my question ~ I'll have to give them a try! we borrowed an amish outdoor wood burner canner that holds 39quarts at time & my husband & I canned 98 quarts in one afternoon!! 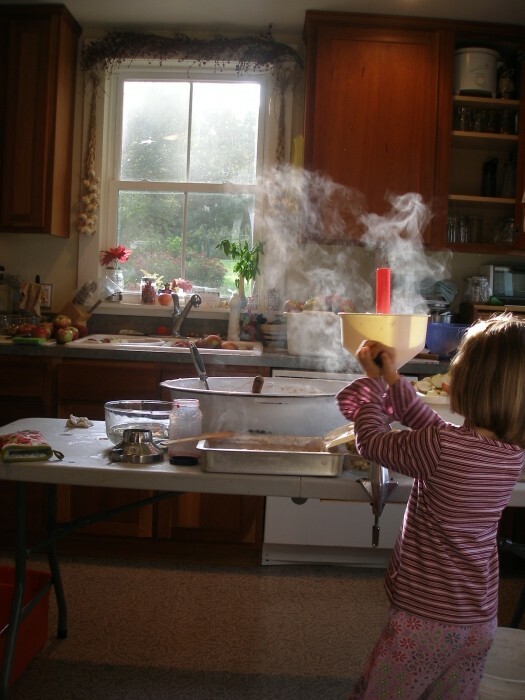 We used it to cook the apples as well & were amazed at how fast it went! I am just in awe that you can and eat that much applesauce! Glad I ran across your post on the apples. I was just wondering, what do you do with all your apple cores? Can you safely feed them to chickens in reasonable amounts? I thought about freezing my cores and giving to my gals in smaller quantities in the winter. I was concerned about the seeds. Too it would be great to know if cooking them down to use for other purposes would be good. I am concerned about the seeds. I know in large quantities they poisonous but I just hate wasting so much. Any info from any of you all would be great...Blessings!!! We have always fed them to our chickens and have had no problems doing so. When we do applesauce, the cores are cooked with the apples and go through the strainer. That's when we give them the largest quantities of seeds (along with the skins, etc.). 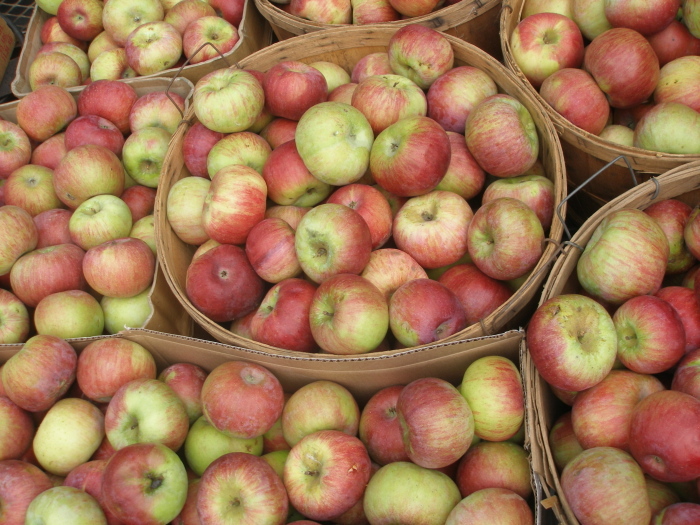 During apple season, they get the raw cores left over from us just eating apples, but in smaller amounts, of course. I've never done anything else with the cores. Holy cow, that's a lot of sauce to do in one day. I guess the huge outside canner and the extra hands make all the difference. I spent a very long day yesterday and only finished 19 jars of sauce. I'm limited to two burners though and don't have big stock pots. Hello, I came from Herrick Kimball's blog on the clothespin entry. I thought 72 quarts was a lot! We got those from our apples last year from one tree. This year, I'll be lucky to get 7 quarts from that tree. So temperamental. My sister lives with us and requires applesauce or other ground fruit, to take her medicine. Any chance you could show a few more details regarding that 15qt caner? All I saw was a stainless steel box and cinder blocks... I'd love to be able to do 15qts at a time (vs the 7 mine holds)!!!! !